Back in 1972, the Advanced Concepts division of the Aircraft Weapons Division came up with a unique idea. They wanted more aerial firepower. They wanted to super size the gun in helicopter gunship. 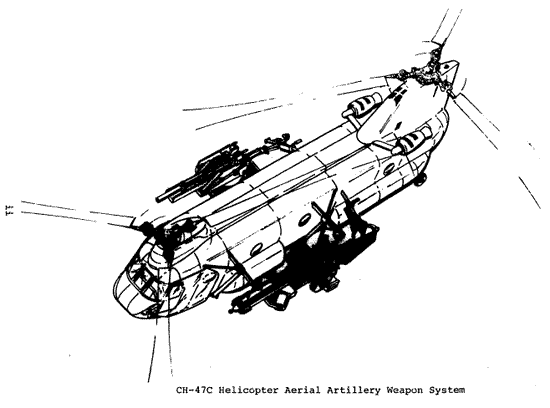 And so they worked up a proposal to put two 105mm howitzers onto a CH-47C Chinook helicopter. The two howitzers would be mounted won on each side of the fuselage, facing forward, and had an automatic loading system for the two guns. The gun crew was a total of 9 men, and a total of 96 rounds were carried for the two guns. Designers forecast a combat radius of 100 nautical miles, with 15 minutes of loitering for finding and engaging targets. The XM204 howitzer was a little different from the standard M101 105mm howitzer in use at the time. The XM204 used a ‘soft recoil’ system, where just before firing, the gun barrel assembly would be pushed forward by a pneumatic system pressurized with nitrogen gas. As the gun barrel assembly moved forward the gun fired, and recoil energy would have to overcome the forward momentum of the gun barrel and breech. This would disperse most of the recoil energy, allowing the XM204 to dispense with the usual trail associated with towed howitzers. Testing was limited to scale blast testing and computational methods. While no full-size mounts were produced, all of the testing work done by the Advanced Concepts Division showed that the concept was feasible. This testing included balance, checking the structure for the ability to take the forces, and verifying that the blast wouldn’t wreck the fuselage or the rotor blades. As best I can determine, no full-size testing was attempted. The project would likely be doomed by problems encountered in the XM204. The ‘soft recoil system’ proved problematic in testing of the gun. The problem of timing the actual firing of the round was never really solved, and the range dispersion ended up being poor. This limitation led to the termination of the XM204 project, and any thought of mounting it on a Chinook. That said, War Thunder needs to put this in game. This entry was posted in All and tagged aircraft, history, militariana on November 15, 2018 by parvusimperator. 9.7 US tree premium when? That being said I probably wouldn’t procure this for Borgundy, even if you could fix the recoil issue and manage to hit something. A Reaper drone seems to have it beat at every metric these days.